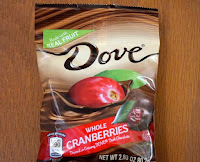 Whole Cranberries "Dipped in Creamy Dove Dark Chocolate"
Welcome to Day #5 of Chocolate and ABC (Apple, Baobab and Cranberry) Theme Week. 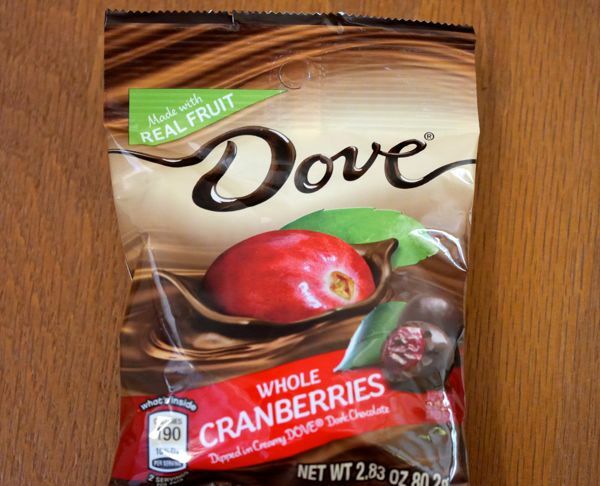 When I opened today's package of Whole Cranberries Dipped in Dove Dark Chocolate, from Mars Incorporated (Hackettstown, NJ), I was greeted with a hot cocoa aroma. The round chocolate pieces came conveniently packaged in a 2-serving bag of individual pieces—dark milk* chocolate around a whole, tangy-sweet cranberry fruit core. 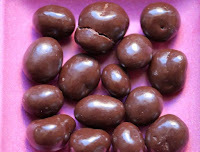 *Note: The dark chocolate coating did have milk in it.